1.Worldwide Access. Cloud computing increases mobility, as you can access your documents from any device in any part of the world. For businesses, this means that employees can work from home or on business trips, without having to carry around documents. This increases productivity and allows faster exchange of information. Employees can also work on the same document without having to be in the same place. 2.More Storage. In the past, memory was limited by the particular device in question. If you ran out of memory, you would need a USB drive to backup your current device. Cloud computing provides increased storage, so you won’t have to worry about running out of space on your hard drive. 3.Easy Set-Up. You can set up a cloud computing service in a matter of minutes. Adjusting your individual settings, such as choosing a password or selecting which devices you want to connect to the network, is similarly simple. After that, you can immediately start using the resources, software, or information in question. 4.Automatic Updates. The cloud computing provider is responsible for making sure that updates are available – you just have to download them. This saves you time, and furthermore, you don’t need to be an expert to update your device; the cloud computing provider will automatically notify you and provide you with instructions. 5.Reduced Cost. Cloud computing is often inexpensive. The software is already installed online, so you won’t need to install it yourself. 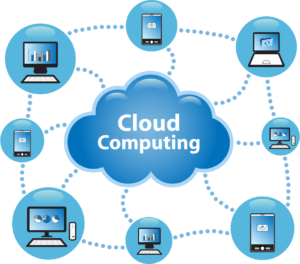 There are numerous cloud computing applications available for free, such as Dropbox, and increasing storage size and memory is affordable. If you need to pay for a cloud computing service, it is paid for incrementally on a monthly or yearly basis. By choosing a plan that has no contract, you can terminate your use of the services at any time; therefore, you only pay for the services when you need them. 1.Security. When using a cloud computing service, you are essentially handing over your data to a third party. The fact that the entity, as well as users from all over the world, are accessing the same server can cause a security issue. Companies handling confidential information might be particularly concerned about using cloud computing, as data could possibly be harmed by viruses and other malware. That said, some servers like Google Cloud Connect come with customizable spam filtering, email encryption, and SSL enforcement for secure HTTPS access, among other security measures. 2.Privacy. Cloud computing comes with the risk that unauthorized users might access your information. To protect against this happening, cloud computing services offer password protection and operate on secure servers with data encryption technology. 3.Loss of Control. Cloud computing entities control the users. This includes not only how much you have to pay to use the service, but also what information you can store, where you can access it from, and many other factors. You depend on the provider for updates and backups. If for some reason, their server ceases to operate, you run the risk of losing all your information. 4.Internet Reliance. While Internet access is increasingly widespread, it is not available everywhere just yet. If the area that you are in doesn’t have Internet access, you won’t be able to open any of the documents you have stored in the cloud.